Dear members of African Betting Forum! Use this topic to share your best current tips and predictions. 1. Feel free to comment and discuss all predictions that are posted but don't go off topic. 2. Motivate your prediction! Tell everyone why you think your tip or prediction is a sure winner. 3. All sports are welcome! For tips and help on how to predict games click here. This weekends highlight is the game between Chelsea and Manchester United! The Red Devils has seen brighter day and were lucky to get away with 3 late points against Newcastle. Last year i would have betted on draw - but on saturday Chelsea will beat Manchester United with 3 - 1! Trust me! Hazard will score the last goal!! Great odds this weekend!!! 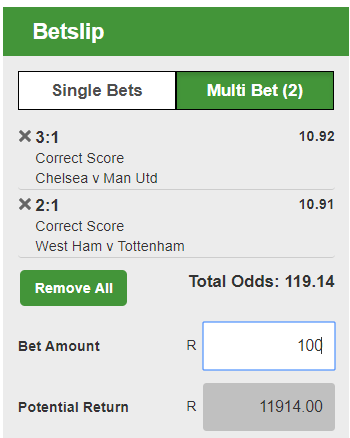 Double chance, correct score: Chelsea - Manchester United & West Ham - Tottenham.